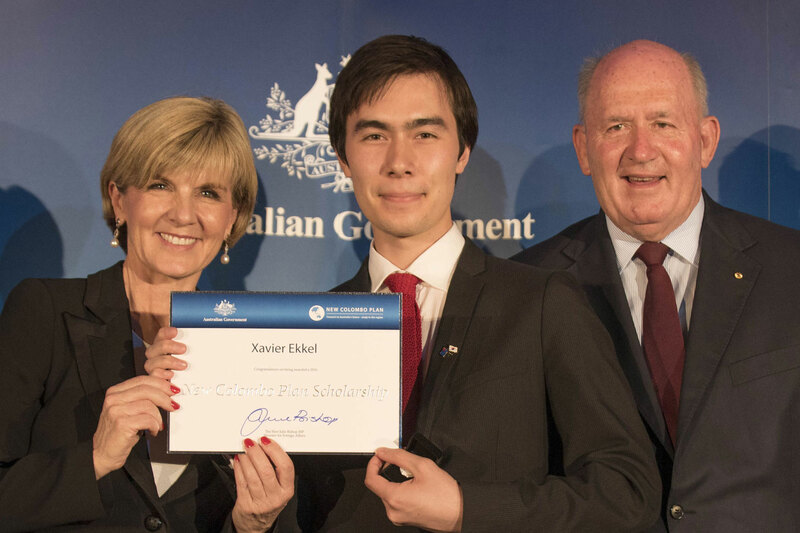 Bachelor of Commerce student Xavier Ekkel was awarded a prestigious New Colombo Scholarship at an event hosted by Deputy Prime-Minister Julie Bishop in December 2015. A self-described quiet thinker and movie buff, Xavier Ekkel hadn’t planned any overseas travel during his Bachelor of Commerce and concurrent Diploma in Informatics, until a 3-month intensive language program at Korea’s Sogang University changed his outlook. Xavier, who has Dutch and Korean heritage, initially went to Korea to improve his Korean language skills and connect with his extended family, but beyond a love for K-pop and Korean BBQ, he found a country whose tech and business sector could offer much more. Xavier is one of five University of Melbourne students and 100 students around the country to receive a NCP scholarship. Run by the Department of Foreign Affairs and Trade, the NCP is a signature initiative of the Australian Government which aims to strengthen Australia’s connection to the Indo-Pacific by supporting Australian undergraduates with study opportunities and internships in the region. "This talented group of students will be impressive young ambassadors for Australia in the Indo-Pacific region, as they undertake studies, gain industry experience and learn about another culture while fostering friendships and networks that will last a lifetime,” Foreign Minister, Julie Bishop said. Xavier Ekkel accepting his award from Deputy Prime Minister Julie Bishop and Governor-General Peter Cosgrove. Community leadership is one of the key criteria students are required to demonstrate when applying for the award, and being involved in the University community has been important to Xavier. On top of his duties as President of the University Film Society, Xavier has actively participated in the Faculty’s Future Leaders Forum and in Case Competitions, and has been involved with the Economics Student Society of Australia (ESSA). His interest in tech and consulting start-ups also led him to attend a number of the workshops and masterclasses held by the Melbourne Accelerator Program (MAP). 2016 is shaping up to be a busy year for Xavier. Before heading to Korea, he’ll also be undertaking a Study Abroad semester at the University of Pennsylvania. He'll then embark on his studies at Seoul National University while also participating in a 6-month internship at a Korean company.